A judge has denied a bid to halt the execution scheduled this coming week of convicted cop killer Troy Anthony Davis, refusing to hear evidence the defense says would show he is innocent and identify another man as the killer. Defense attorneys said they would appeal to the Georgia Supreme Court. Davis, 38, is to die by injection at 7 p.m. Tuesday for the 1989 killing of Savannah police officer Mark MacPhail, who was shot while moonlighting as a security guard. Davis insists he's innocent. His lawyers filed a motion last Monday seeking a new trial based on affidavits by witnesses from Davis' 1991 trial who now say they lied or exaggerated when they testified Davis shot the officer. Davis' lawyers also say other witnesses have signed affidavits naming another man, Sylvester "Red" Coles, as MacPhail's killer. 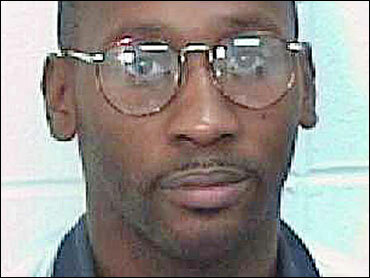 "The new evidence does not merely impeach state witnesses, but destroys the prosecution's case and establishes Red Coles' guilt," defense lawyer Thomas Dunn wrote, saying "a grave injustice may result from the execution of Troy Davis." The Associated Press has been unable to locate Coles for comment, and another Davis attorney, Jason Ewart, declined to say if he knows Coles' whereabouts. Superior Court Judge Penny Haas Freesemann said in her ruling Friday that Georgia courts generally do not favor granting retrials in such cases, and that the evidence presented by Davis' lawyers failed to meet strict standards required by state law. Prosecutors had argued that most of the witness affidavits, signed between 1996 and 2003, were included in Davis' previous appeals and should not be considered new evidence. Davis' lawyers say appeals courts never considered any new evidence, instead focusing on whether his constitutional rights had been violated. "Clearly, the defendant has brought these motions for the purpose of delay," David Lock, Chatham County chief assistant district attorney, wrote in a response filed Tuesday. The judge also rejected the affidavits by people claiming they heard Coles confess to the murder, say they "contain inadmissible hearsay." Davis is also scheduled to have a clemency hearing Monday before the Georgia Board of Pardons and Paroles, and will have one powerful supporter. U.S. Rep. John Lewis, an Atlanta Democrat and civil rights icon, plans to testify to Davis' behalf out of concern that the state is executing an innocent man, said Lewis' spokeswoman, Brenda Jones. According to court records, Davis shot MacPhail twice — in the face and chest — after the officer went to help a homeless man who cried out after someone struck him in the head with a pistol. The shooting took place in a parking lot next to the bus station where MacPhail was a security guard. Davis' lawyers say seven of nine witnesses who testified in 1991 — saying they saw Davis shoot the officer, saw him assault the homeless man before the shooting or heard Davis later confess to the slaying — have since recanted or contradicted their testimony. Other affidavits from three people who did not testify at Davis' trial say Coles admitted killing the officer after Davis was convicted. Coles testified against Davis in 1991. Donald E. Wilkes Jr., a University of Georgia law professor who specializes in the death penalty, said Georgia is the only state he's aware of that allows death row inmates to seek a new trial after their appeals have been exhausted. However, state law also requires defense lawyers to show evidence that meets very strict standards.